The Empire State Building, tallest in the world, is yielding up new facts to scientists studying the behavior of skyscrapers in lightning and wind storms. 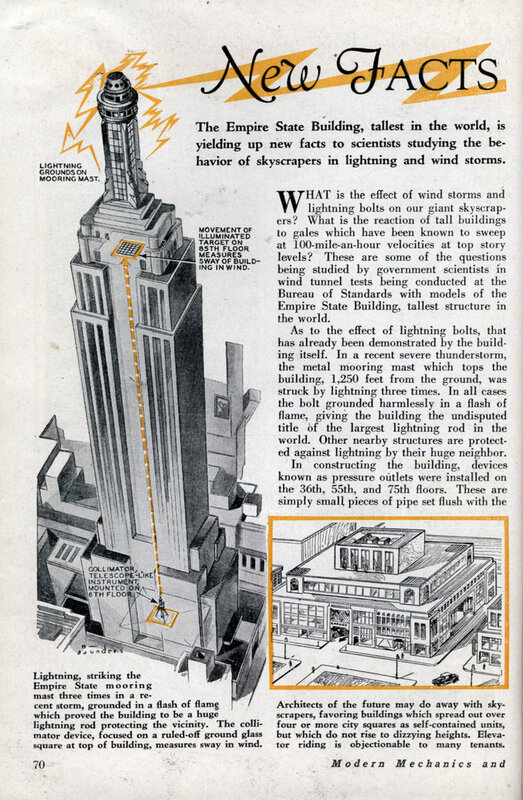 WHAT is the effect of wind storms and lightning bolts on our giant skyscrapers? What is the reaction of tall buildings to gales which have been known to sweep at 100-mile-an-hour velocities at top story levels? These are some of the questions being studied by government scientists in wind tunnel tests being conducted at the Bureau of Standards with models of the Empire State Building, tallest structure in the world. As to the effect of lightning bolts, that has already been demonstrated by the building itself. In a recent severe thunderstorm, the metal mooring mast which tops the building, 1,250 feet from the ground, was struck by lightning three times. In all cases the bolt grounded harmlessly in a flash of flame, giving the building the undisputed title of the largest lightning rod in the world. Other nearby structures are protected against lightning by their huge neighbor. In constructing the building, devices known as pressure outlets were installed on the 36th, 55th, and 75th floors. These are simply small pieces of pipe set flush with the outside wall, through which the wind blows against a column of liquid which registers pressures on a gauge. This is the familiar Pitot tube principle which is used in airplanes to measure air-speed. These give handy readings of wind pressures on the building at all times, and the same principle is being employed in the aluminum model which is being used in tunnel tests. The question of sway in tall buildings may seem unimportant, considering the fact that rarely is it greater than two inches, but to the office worker seated 1,000 feet in the air, trying to work, a slight sway can easily become annoying, and may even induce an element of unconscious fear in the case of nervous temperaments. That is why skyscraper builders are eager to eliminate sway. Many people are unable to accustom themselves to swift travel in elevators, which is another factor working against skyscraper popularity. Col. William A. Starret, whose company erected the Empire State Building, does not believe that skyscrapers will go any higher, for a long time, at least. He foresees buildings no higher but much broader than present-day types, spreading out to occupy entire city squares, or even two or four squares. An instrument known as a collimator is a unique feature of the Empire State Building. This device is essentially a telescope mounted on a tripod in the fire shaft at the sixth floor level. This shaft goes straight up to the 85th floor, where an illuminated target has been placed. The target is crisscrossed with hair-lines at quarter-inch intervals. Any one looking through the collimator can thus tell the number of inches the building is swaying at its top. I learned that the Empire State Building swayed when I was a kid and have always wondered how they measured that. The collimator is simple and effective, very neat!